SKU: sjs22. Category: Canvas Print. 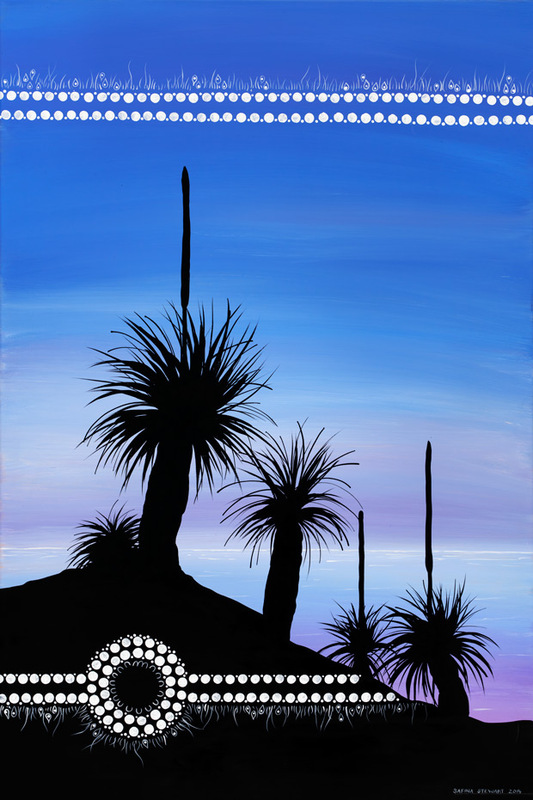 To our Aboriginal people the Grasstree has always been a precious resource. Each part of the grasstree can be utilised – the seeds can be ground for flour, the tender white leaf bases are edible, the leaves used for matts, its flower nectar can make sweet cordial, its resin used like glue, its oil as deodorant, and its fibres and stalk used to make tools and weapons. The Grasstree is an immensely useful, versatile resource. We have named our gathering of emerging and established Christian Indigenous leaders “The Grasstree Gathering” because of the symbolic parallels we have to the Grasstree. As emerging and established Christian Indigenous leaders we recognise the value of gathering together, sharing stories of hope and encouragement. Therefore, becoming even more ‘immensely useful, versatile resources’ to the communities from which we come from, to Christian ministry and to the leadership of Australia. In this painting, each Grasstree is different yet strong in its uniqueness and capacity. Despite being rooted at a cliff edge and surrounded by fog, they stand together, dignified and tall in their purpose.